Let’s upgrade your brunch game and introduce you to your new favorite way to cook eggs! 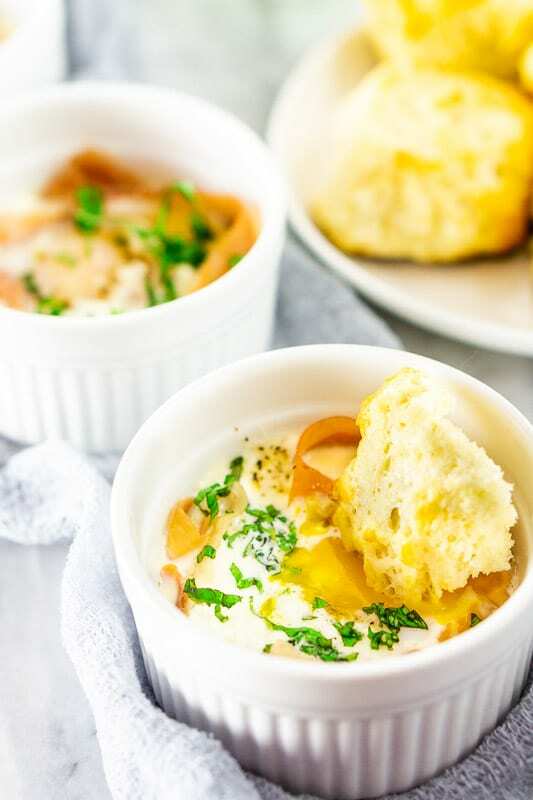 These prosciutto and goat cheese eggs en cocotte are gently baked with a drizzle of heavy cream for a custardy, luscious texture and finished with a sprinkling of fresh basil. 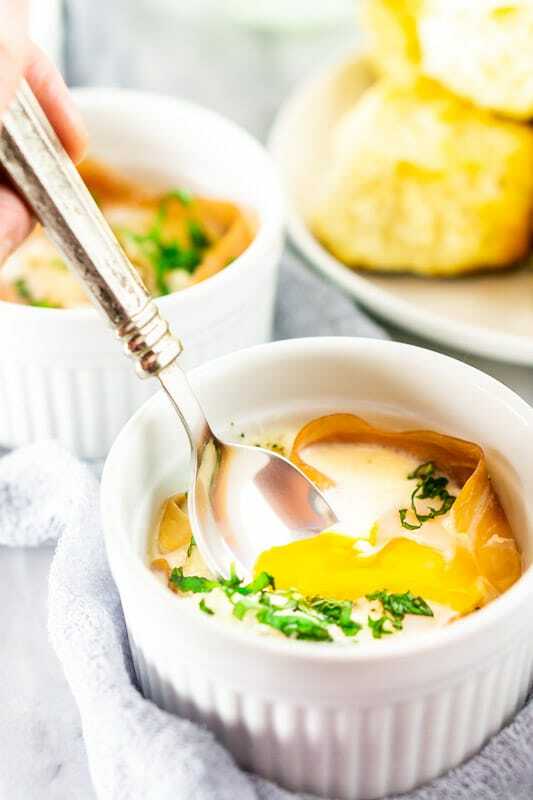 Simple and quick to prepare, eggs en cocotte are the perfect brunch dish for entertaining and always a crowd favorite. Now that spring is finally here, I find myself wanting brunch more than ever. With Easter and Mother’s Day coming up, I go into planning mode, and for us, those holidays mean brunch. Naturally, the more I think about brunch, the more I crave a good brunch, so I feel extra excited to share such an easy and delicious egg recipe with you today. Plus, there’s something so spring-like about enjoying a mimosa or two on a beautiful weekend day while brunching with friends on a patio. To me, a nice outdoor brunch is the perfect way to welcome the warmer days, and I, for one, am so ready to move on from winter. Bring on outdoor brunches! What Are Eggs en Cocotte? Basically, eggs en cocotte is a fancy way of saying eggs baked in ramekins or small pots. As you may have guessed, eggs en cocotte is a French-style preparation with the technical French term being oeufs en cocotte — oeufs meaning eggs in French. Look at that. Come to a food blog and get a language lesson. Eggs en cocotte are also known as shirred eggs, but I don’t like calling them that. Shirred eggs doesn’t sound nearly as fancy and fun. Say it with me, “Shirred.” It’s just not a pretty word, but eggs en cocotte? That sounds like one appetizing brunch dish. But enough about that. Let’s start cooking! Before we jump into the recipe, let’s take a moment to gather our ingredients. Here’s everything you need to make these delicious baked eggs. We start by buttering six ramekins. This keeps our eggs from sticking to the surface. Now we take a slice of prosciutto and wrap it around the inside of each ramekin, making a little nest. If needed, you can tear the prosciutto to help it fit. 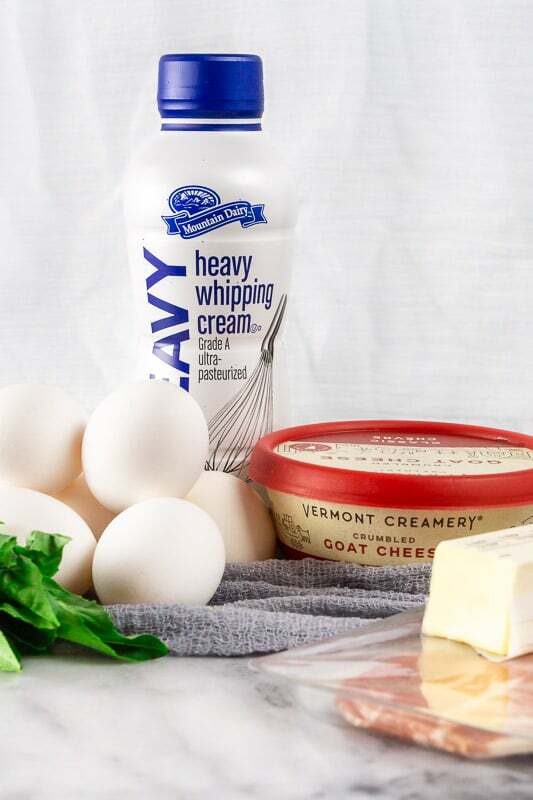 Inside the prosciutto nest, we crack an egg and top it with heavy cream, salt, pepper and goat cheese. And just like that, we’re ready to start baking. That was quick, huh? To bake these eggs, we put our ramekins in a large pan with boiling water to make a water bath. This method evenly heats our eggs to prevent potential curdling. We add just enough water so that three-fourths of the ramekins are covered and pop them into a 350-degree oven. Exactly how long we bake the eggs depends on how you like the consistency of your yolk. See all that liquid goodness below? I baked these eggs for 16 minutes to get that type of consistency, which was just enough time to set the egg whites. If you want more of a jammy egg, which I also love, a few more minutes will do. Once our eggs cook to our liking, we pull them out of the oven, sprinkle with fresh chopped basil and get ready to enjoy one decadent brunch. For making the water bath, I find boiling water in a tea kettle is less messy and a bit easier to control when pouring hot water. If you don’t have a tea kettle, you can simply boil water in a pot but pour it in the pan slowly to minimize splashes. When checking on the baking time, keep in mind the yolks will continue to cook once they come out of the oven. This recipe is easily customizable. Looking to cut back on meat? Skip the prosciutto and add spinach. Not a big goat cheese fan? Try some freshly grated Parmesan or a nice melting cheese, like fontina. You get the picture. When removing the ramekins from the oven, tongs or a spatula work well. You’ll also want to set the ramekins on a kitchen towel, so you’re not plating the eggs with hot water dripping all over. While these baked eggs are delicious on their own, they’re also perfect for dipping crusty bread, toast or biscuits. If you follow a gluten-free lifestyle, no worries. Just use your favorite gluten-free bread. You can never have too many brunch recipes as far as I’m concerned. If you’re in need of a little more brunch inspiration, try these recipes. Did you find this blog post and step-by-step instructions helpful? 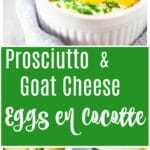 I hope you love this prosciutto and goat cheese eggs en cocotte recipe as much as I do. Trust me. You’re next brunch just got a whole lot more delicious with this recipe. 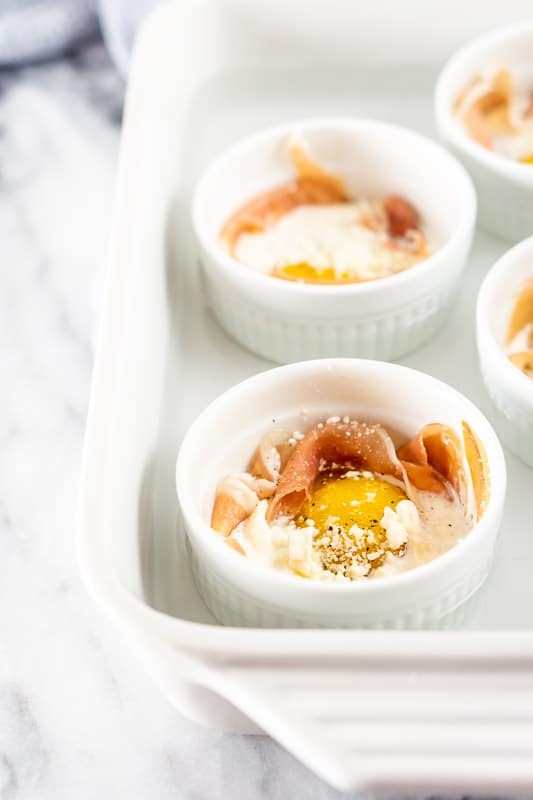 If you try these prosciutto and goat cheese eggs en cocotte, you’re welcome to leave a comment and rating below. I love hearing from you! You can also sign up for my newsletter on my website here and FOLLOW ME on FACEBOOK, TWITTER, INSTAGRAM and PINTEREST to see more delicious food I’m creating! Happy brunching! 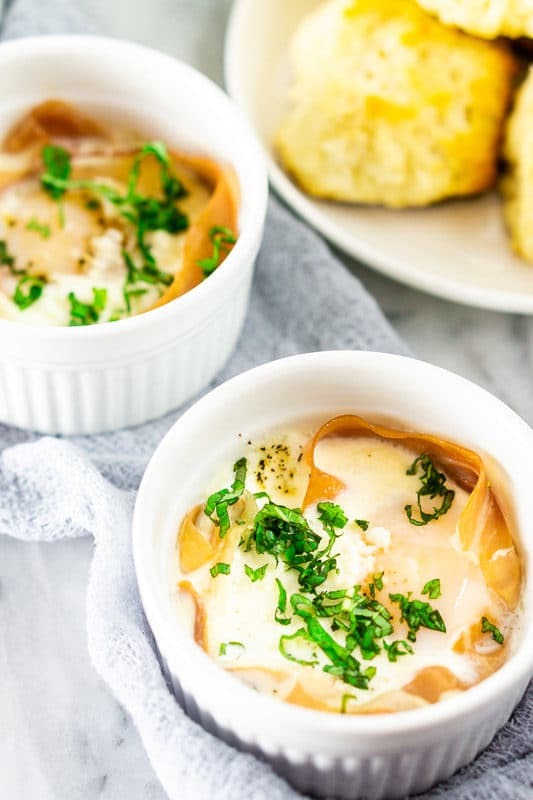 These prosciutto and goat cheese eggs en cocotte are gently baked with a drizzle of heavy cream for a custardy, luscious texture and finished with a sprinkling of fresh basil. 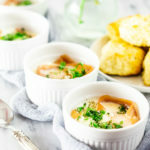 Simple and quick to prepare, eggs en cocotte are the perfect brunch dish for entertaining and always a crowd favorite. Heat oven to 350 degrees and start to boil water for the water bath. 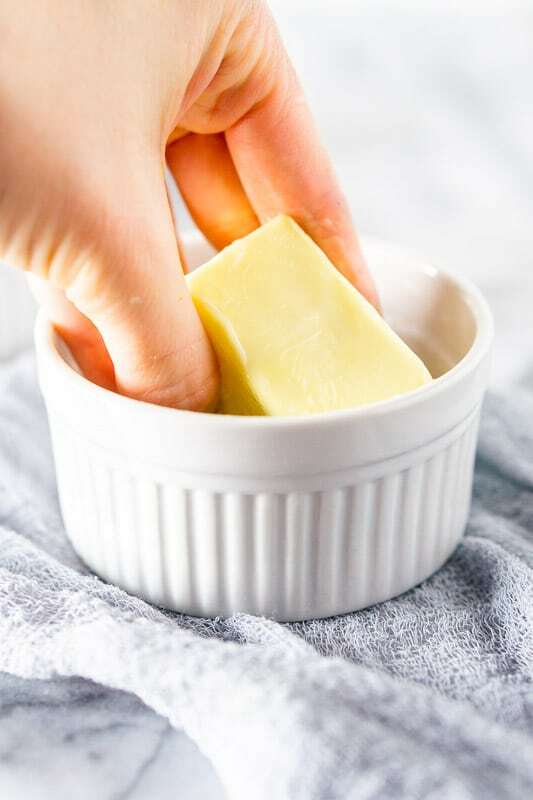 Butter the bottoms and sides of six 4-ounce ramekins. 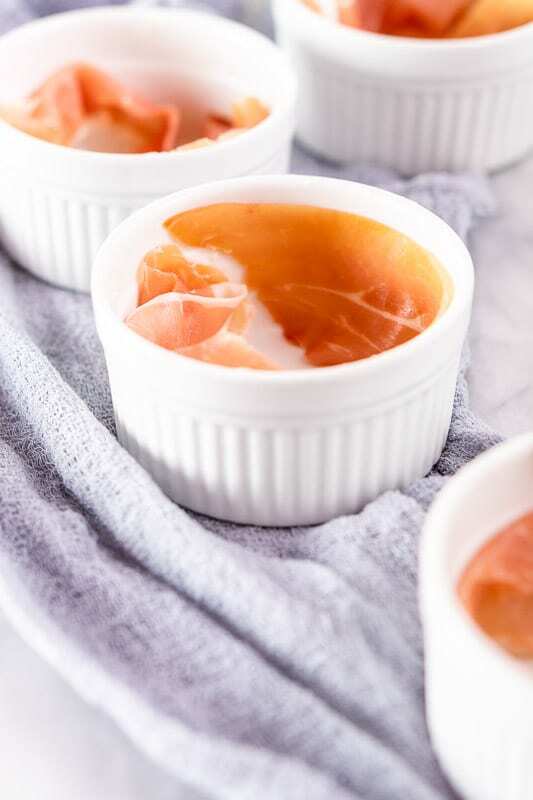 In each ramekin, nest a prosciutto slice around the side. If needed, tear the prosciutto to help it fit. 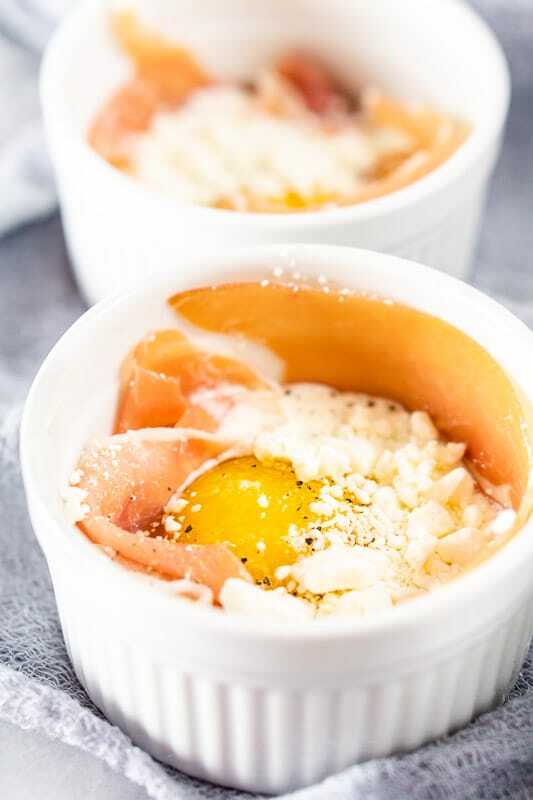 Crack one egg into each ramekin in the middle of the prosciutto nest. Drizzle 1 tablespoon of heavy cream over each egg for a total of 6 tablespoons. Do the same with the goat cheese and season each ramekin with salt and pepper. Place the ramekins in a large pan and slowly pour in enough boiling water so that it covers the sides of the ramekins by three-fourths. Bake until the white eggs set and the yolks are cooked to your liking, about 16 to 20 minutes. Use tongs or a wide spatula to remove the ramekins and place on a towel to dry the bottoms. Sprinkle with freshly chopped basil and serve. Enjoy! This is a recipe I’d want to get out of bed for! Definitely a tasty way to start the day. You certainly can’t go wrong with prosciutto and goat cheese. Those are two of my favorites. I just may make this for myself on Mother’s Day. Hi Marisa! This recipe is great for Mother’s Day or Easter! Such an amazing treat, for sure!! This is the perfect recipe to make for brunch!!! Yes! Perfect for Easter brunch, too! !